Visso makes part of the Park of the Sibillini Mounts, national area protected and extended mainly on the Marches and a border of the Umbria of which makes part the splendid Norcia. According to the tradition Visso was founded 907 years before Rome by Naharci (literally “men from the long lance”), Sabin tribe dedicated to sheep farming near the Nahar river (Black) that here still passes. With the Sentino battle (295 a.C.) it began the Roman supremacy on the italic populations of the Central Italy and Visso followed the fates of the Republic of Rome and the Empire later. It followed the invasion by Goths with sacks, the belongings to the Byzantine Empire before and subsequently to the Longobard Duke of Spoleto (579). After the Frank age and the annexation to the Roman Church Visso knew the free autonomy organizing itself in Comune and competing with the bordering cities. Returned to the Church Visso knew in the '400 pillages by bandits, period passed to the history like the “ruina of Visso” (Visso's ruin) also because of several pestilences. The Visso that we meet today flourished commin trades and and architecture in '500 and '600. The visitor enters into the city from Porta Santa Maria and immediately it is dipped in the beauty of Piazza dei Martiri Vissani, that guards the architectonic jewels of Visso: on the left the Church of S. Agostino (XIV sec. 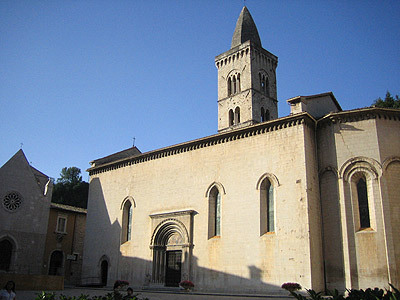 ), center of the Museum of the Leopardi's Manuscripts, with Gotic portal the splendid Collegiata di Santa Maria (1256) with Romanesque-gotica structure and beautiful portal and arch. The Collegiata keeps in its inside frescoes by Paolo di Visso and umbria-marches school. In the same public square it is not impossible not to notice the beauty of the palaces: Palazzo Varano (1516), Palazzo dei Governatori (XIII cent.) on the right, il Palazzo della Pia Casa. 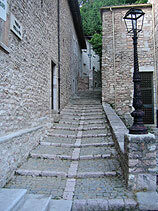 Impossible to cite here all the architectonic jewels of Visso, known also like “pearl of the Sibillini Mounts”.